Sitey Review 2018: A Promising Website Builder, But Is It Enough? Sitey is a really promising website builder that could go toe-to-toe with the more established platforms in the industry. It offers hundreds of customizable templates that span various categories, an intuitive drag-and-drop website builder, a good price range, and some freebies thrown in for good measure. However, it is held back from being truly great by quite a few issues. But is it still a worthy recommend despite these flaws? Keep on reading to find out now! Templates – Sitey offers hundreds of fully customizable and mobile-optimized templates for you to choose from. These span a multitude of categories as well – from portfolios to wedding websites, and beyond. Ease of Use – Building a website using Sitey’s builder is quite easy, especially as it employs drag-and-drop functionality, allowing you to simply click and move elements around as you wish. There is also an intelligent feature that detects if you are somehow stuck at a certain stage in the creation process and offers you relevant tips to help you progress. Free Plan – Sitey offers a completely free plan which you can use to try the service out. If you are simply looking to build a small website, then this could also be a very good option. Freebies – You don’t need to find a separate hosting plan – this is included across all plans (yes, even the Free one). Also, if you subscribe to any of the paid plans, Sitey gives you free ad credits. Templates – While it’s great that Sitey offers a good number of templates across various categories to choose from, there are quite a handful that look rather similar – and sometimes even plain. Thankfully these are fully customizable – so there is that. Plan Limitations – Sitey’s Free plan is, understandably, quite limited, making it only good for some cases. The Starter plan, meanwhile, lacks the mobile sites feature – which is odd since the Free plan has this. Slightly Confusing Pricing – The posted prices on Sitey’s website are not the regular rates, but, rather, promotional prices. They don’t really disclose the actual rates, which might lead to some surprises when your first term of service ends and your plan renews. 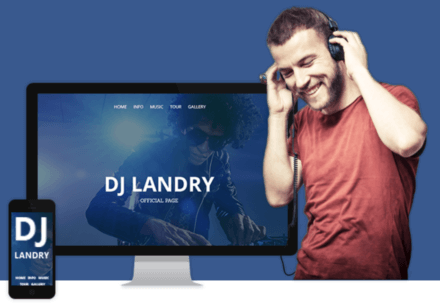 Multimedia Features – If you are looking to build a website that is quite heavy on multimedia – say, a band website with videos, music, and the like – then Sitey might not be the best option for you. They offer little in the way of multimedia features. Sitey’s website builder is a pretty no-frills affair. It is laid out in a clean, uncluttered manner that makes it rather pleasant to use – even for long stretches of time. Your website is the focus here, as the builder layout, with its unobtrusive side menus, makes abundantly clear. This makes it easier to see the changes you make – as opposed to other platforms that bombard you with menus. At Sitey, menus only take up a small space of screen real estate – on the left and up top – but contains nearly all the options you can make use of in creating a website. As for the actual creation of your website, simple one-click actions will bring up the options you need. You also simply drag elements around and position them where you want. Sitey also makes use of snapping so you won’t end up with a messy website. You can also switch between desktop or mobile view, allowing you to see how your website looks on either in real-time. Overall, Sitey’s website builder does the job pretty well. It is basic, but that isn’t a knock on it. In addition to Sitey’s website builder, you also get a ton of really useful features that should make your site building experience that much better. For starters, you can choose from a wide range of templates across numerous categories. Want to build a blog? No problem. How about a website for your Hotel? They have you covered. Need a wedding website? Sitey has templates for all of these and more. Even better, they are all fully customizable and are even mobile-optimized – allowing you to mold it to your heart’s content and showcase it on mobile devices. One of the few things that might turn off some people is that a good chunk of Sitey’s templates, though largely professional-looking, look and feel similar. As a result, a lot of these don’t really end up drawing you in and giving you that “wow!” factor. On the other hand, these are customizable templates, so users can inject that into their websites themselves. Another thing that Sitey lacks is in the multimedia department. While you do get an image library you can integrate into your site, that is as far as it gets on the multimedia front. If you are, say, a photographer looking for more advanced features for showcasing multimedia, then you would be better off with other options. What Sitey does do right, however, is giving users a host of basic features that every website nowadays should have. You get reliable hosting, custom domains, SEO, blogging features, social network integration, Google Analytics, and even the ability to add an online shop to your website. If you are interested in getting a Sitey subscription, you should consider checking out their Free plan first. This offers limited features and displays an ad at the footer of your website, but it is a good way of taking their website building service out for a test drive. Also, if you are an individual looking to build a small website, this is also a pretty good choice. You are allowed up to 5 pages, 50MB of storage, 5MB file uploads, 1GB of bandwidth, free hosting, access to all templates with mobile optimizations, an image library, and the ability to link to your social media accounts. For those looking for more features, and to get rid of the ads, the Starter is the least expensive of the three paid plans. For $7.79 per month (monthly billing) or $6.99 per month (annual billing), you get all of the features of the Free plan (minus mobile sites – go figure), plus Google Analytics, free hosting, free ad credits, 1GB storage, 10MB file uploads, 2GB bandwidth, the ability to use your own domain, and access to the Support Center and 24/7 customer support. The Pro plan, meanwhile, will cost you $8.99 per month (monthly) or $7.99 per month (annual). With this plan you will get all of the features of the Starter, plus 5GB of storage 25MB file uploads, 10GB bandwidth, mobile sites, and the ability to display your website’s logo in browser tabs. Finally, if you are looking to build an online store, the eCommerce plan should fit the bill. At $15.99 per month (monthly) or $12.99 per month (annual), you get all the features of the Pro plan, plus eCommerce features, 10GB of storage, 50MB file uploads, unlimited bandwidth, instant qualification for Sitey’s company directory, and priority support. It is also worth noting that, across all paid plans, you can get a free domain if you subscribe via an annual billing method. Another thing that is worth mentioning is that, according to Sitey, these prices are promotional prices and not the regular rates. This means that once your first term of service ends, your plan will renew at the regular rates. The problem is that Sitey fails to properly communicate what the regular rates are, so if you miss the small disclaimer at the very bottom of their pricing page, you might be in for quite a surprise come renewal time. Sitey offers good overall customer support. You get access to a comprehensive knowledgebase if you want self-help options regarding technical or billing aspects of their service, or you can contact them via online form or their phone lines. For those subscribed to the eCommerce plan, you get priority support – meaning your concerns will be among those that are first attended to by their team. What's the Verdict on Sitey? Sitey offers a really solid, if a bit basic, foundation that is, unfortunately, hampered by a number of issues. But If you want a simple website builder that offers a lot of professional-looking, mobile-optimized templates that you can easily customize to your liking, then this is definitely for you. If you are looking for something a bit more advanced and more refined, however, you might want to check out better alternatives out there. Overall, this is a worthy enough recommendation – just be wary of its flaws.